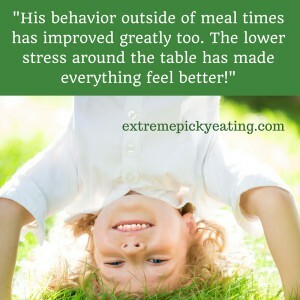 Sharing one mom’s early successes (and tips) with her son with extreme picky eating. My 3.5 year old and I needed some help. I read your book, Helping Your Child with Extreme Picky Eating and started the process this past Friday. While reading the book I realized how emotional I have been about our struggle with food. My husband was on board when I told him about it. My family said they’d be respectful and help. My son’s daycare already operates just as your book describes. While I teared up several times while reading the book, as it so closely related to my sense of failure, it gave me hope to try something new. He is developmentally fine, but is spirited and strong willed. The struggles seemed to be escalating and I was ready for help. Since starting last Friday (one week of trying) things have already gotten so much better!!! I started our dinners new with all glass serving dishes so he can see the food. Changed the placemats and put flowers on the table so I felt like it was a fresh start. Since starting STEPs+ he helped make blueberry pancakes (winced when the blueberries came out, but I wanted them so I stayed the course) and then at the table he put one on his plate!!!! He has watched me eat cherries (many times) acting as if he’s not watching. Today he asked if I eat the stem. When the dessert is on the table he eats a bit of it, but goes to his safe foods and eats them instead. His asking for crackers has almost stopped and he sits at the table with us, usually laughing as we talk about anything but food. He’s put an artichoke and asparagus on his plate. He even told me he tried the crust of his pizza. He asked about a picture of corn in a book too. He seems super interested. I want to write it all down to share my sense of hope! My husband has expressed his happiness with how things are going too. I’ll stop with the snippets of success and just say THANK YOU! I am prepared to be discouraged as time progresses, but I will stay the course and trust my son. Your writing is clear and the process easy to follow. It seems like it’s how I was fed as a child. I’m planning on reading parts again if I get discouraged. Hopefully we just keep moving forward though! I do want to add that his behavior outside of meal times has improved greatly too. He’s a super little guy, and the lower stress around the table has made everything feel better! Thank you. Thank you for guidance that was actionable and, so far, moving in a positive direction!!!!! Follow-up: we asked this mom to share about the glass dishes so we could pass this tip along! “As far as the glass dishes…you ask us to envision our table… and I felt that my son probably could not see the food, just bowls, so I bought a set of 20 glass dishes with lids (all different sizes and an inexpensive set). It has been so easy to put the bowl of berries/veggies/etc back into the fridge for another meal, and it does seem like he has a good view of all of the options. Since I wrote a few days ago it has been the holiday weekend. A family BBQ proved to be stressful as he ate two cookies and chips, but I stayed focused on the long game of trying not to stress him out, instead of worrying what my friends and family thought of my parenting. It’s almost like he was testing me when he went for more chips. I said NOTHING. That’s been my approach...laugh, smile, talk about everything else but the food. When we got home he said she was hungry. I asked him to wait as I prepared a snack that we’d eat at the table (no more crackers running around). He ate a bowl of tomato soup! He also stirred the cucumber, tomato, onion salad and showed me how he could get the cucumber on his fork. He fed it to me instead of himself, but I think this is progress. He even curiously touched the onion that stuck in the fork. I will be patient and try to stay focused on believing in his choices and hunger as I work on routine and structure with no pressure. Again, thank you for your efforts. I’m sure there are worse things, but not being able to feed my son has been one of the most difficult (slow acting) challenges I have faced. I truly feel like I have failed at one of the most important things. Your book is giving me focus, a plan, and hope. We are so happy for this family, and while sharing her story, want to point out several tips and themes she hints at. This is tough stuff. When a child doesn’t eat much amount or variety, it is scary, and parents often feel judged and unsupported. Understanding why a child might struggle with eating, and how to support children empowers parents to feed with confidence, and even enjoy mealtimes. Having support from spouse, child care providers and family is wonderful and will make the process easier, but you can’t count on it, in fact it isn’t uncommon to disagree. Here is a post with ideas if you aren’t on the same page with a partner or others involved in feeding or mealtimes. Stage 1 or early progress is about attitude, not bites! This young man may not be eating lots of new foods, but he is happy at the table, and his curiosity is emerging as he watches mom eat, asks questions and interacts more with foods. Expecting children to go from fearful of new foods to immediately devouring artichokes is unrealistic. This kiddo shows early progress around trying new foods as well, eating tomato soup, and putting new foods on his plate. For some children this progress comes quickly, for others it takes more time. Love her tip about the glass bowls, which lets him see the food, and how serving family-style lets him put foods on his plate (artichokes), even if he doesn’t eat them for a while. General happiness and behavior often improve once the stress around mealtimes is gone. If kids eat (or don’t eat) 3-6 times a day, that stress can impact the whole day, not just the time at the table. Write it down, as this mom does. Journaling can help track early progress, like not asking for crackers all day, while you wait for other skills and curiosity to emerge. Feeding kids in public is hard. It can feel like you are being judged (you probably will be no matter what you do). This mom acknowledges that going in to the family BBQ and stays focused on the long-range goal of less stress and power struggles. Don’t focus on the food. This family is now serving food sitting at the table most times, rather than on-the-go. This and a routine of offering foods every few hours supports appetite and curiosity. We love success stories, and know that for parents who have struggled for months or years with extreme picky eating, learning to trust the child and how to support and facilitate the child’s joy, appetite and curiosity around eating is really scary. Thanks to this mom for sharing part of her journey and success with other parents. There is hope!